Salutations to Sarasvatī - the divinity of learning. I am going to start studies, may success be mine, always. Small kids are taught this shloka (verse) when they start school. Maybe not anymore in English medium schools in India. But in the Sunday School (culture/heritage schools) abroad, Indian families still teach this. Maybe they miss the culture more than those in India. It is always true that most of us do not know the value of something unless we don't have it. 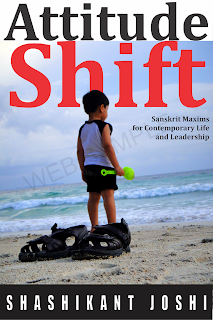 Going out of India, parents feel the need of self-identity, and focus much more on the culture. Why is the divinity of learning, knowledge called Saraswatī सरस्वती - the name of a river, whose literal meaning is 'one with flow'? Why is she called boon-giver? Why is she called Kāmarūpiṇī ? Shouldn't that be Lakṣhmī लक्ष्मी - the divinity of prosperity? The words saritā (सरिता = river), sarovara (सरोवर = lake), sarī-sṛipa (सरी-सृप = reptiles), sarpa (सर्प = serpent) all have the same root - to flow. Water flows. That is its dharma (धर्म) - defining quality. Actually the generic term for liquid is the same as for water! That is another digression in 'what is dharma?' The defining quality, that quality which upholds the identity of the entity. For example, the dharma of student is to study. If s/he is not studying, it is just enrollment in the class, not studentship. Now, knowledge is free flowing, for all. For example, if you tune off your TV or radio, do the broadcasting waves not exist? They do. Just that you are tuned out of them. Similarly, to learn you need a radio, and a tuner to tune in. The laws of nature, physics, gravity have always been there, only Newton first formulated the laws in the western world. From where do great scientists make discoveries and invention? At the forefront of research, it ultimately comes from one's own brain! From inside, not outside! So it is all up for grabs. Patent etc. are modern ways to stop the flow of this perennial knowledge. How did they do this earlier? Using codes, secret knowledge was passed on selectively, or not telling the recipe but giving the medicine. In Hitopadéshaḥ हितोपदेशः there is a shloka that says to keep many things secret - recipe of a medicine, financial loss, net worth, past affairs, etc. The other reason suggested is that in the Vedic times the river Sarasvatī (of the Sarasvatī-Sindhu Civilization, also known as Indus Valley or Harappa Civilization) had lot of activity going on along her banks. Centers of learning abounded. The later day Takṣhashilā (Taxila of modern Afghanistan) had the world’s first recorded University with boarding dorms, hundreds of teachers and thousands of students from much of the known world that mattered at that time. With time the river’s name itself became synonymous with knowledge. 2. Why is she called boon-giver? 3. Why is she called Kāmarūpiṇī ? Shouldn't that be lakshmI - लक्ष्मी the divinity of prosperity? The word kāmarūpiṇī can be understood in the three ways. First, "One who has a desirable, form (rūpa)." She is beautiful indeed. But these adjectives are used in praising any divinity that a devotee might choose. So to Shiva devotees, Shiva is everything; to Viṣhṇu devotee, Viṣhṇu is everything. 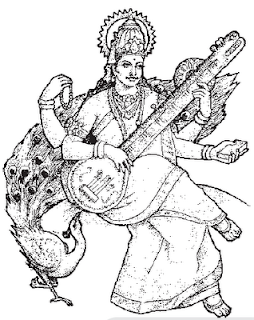 The Dévī has three forms – Sarasvatī, Lakṣhmī and Shakti. All are beautiful. Then there is tripura-sundarī, and Viṣhṇu in Mohini avatāra. So this doesn’t give her any special meaning. The second meaning is “One who takes any form (rūpa) that she desires (kāma)." Here the reference would be to the Dévī taking various forms in fighting dark forces of demons, as described in Dévī-Māhātmya. There again it doesn’t distinguish Sarasvatī. She is also one who takes form as the devotee desires. That is, in whatever form you need learning, she appears in that way for you. Learning is of many kinds. If you focus on her, the solution to your problem will appear. That learning, solution is her own form, suited for your situation. The third way to look at it would be "One who gives form (rūpa) to [one’s] desire (kāma)." This seems to give Sarasvatī, as the divinity of knowledge, a special meaning. We think that for a project the most important thing is resources, money, venture capital. But what if there is no technology, brain power to back that project? Will a venture capitalist put his or her money in a company that has no brainpower behind it? The world had enough resources and money even 500 years back, but we went on moon only after the knowledge of rocket science developed to a certain level. So, we may desire, but the desires turn into reality only through knowledge (of how to turn them into reality). kAma / kāma = desire, roopa /rūpa = form. So knowledge turns desires into reality. A simple shloka for starting students has so much deep meaning hidden in it. This is also called the Saraswatī mantra. Hope you found it useful. 'siddhir_bhavatu té sadā' = May success be yours, always. Thank you, Shashi. I really enjoyed your translation and find it extremely useful. Jai Saraswati Maa! thank you for giving up some of your time to type the comment. i am glad it has been useful to your understanding. thanks for the meaning.i have been reciting this sloka since childhood and now i know the correct meaning,it was very helpful.thanks once again. @anon - you are welcome. it is one thing to know the literal word meaning, another to know the deeper meaning. when it is said "true wisdom gives true devotion" this is what is meant. when you realize, understand the truth, no one needs to force you to bow, head goes down automatically. can you please tell me whether this is the complete slokam? I recite two more lines and I am trying to find the exact lines so that I can correct my slokam. This sloka has been a part of my school prayers since childhood. you are most welcome, suman. please do spread the word for anyone who maybe interested in seld-kalyANa :) this site is a humble attempt to help people understand what they already (are forced to) believe in. knowledge without understanding is mere burden! I chanced upon this blog-post while searching for shlokas worshipping Ma Saraswati. Thanks for explaining this shloka so well. Could you also kindly provide the explanation for the language elements in another famous shloka "Ya Kundendu Tushara haara dhavala..." ? Can any one please let me know the author or source (from any scripture like puranas etc) of 'saraswati namstubhyam....' and 'yakundendu tushaara...' as well as 'Padmapatra visalakshi ' Million thanks in advance. dande, this seems like telugu. i am sorry i do not know telugu. thanks,pl explain the entire shloka. Can you add complete prayer as this one? Sa mam patu sarasvati bhagavati nihshesha jadyapaha. After 31 years , I found the meaning of this sloka. No one taught the meaning of this so far, but now I understand. Thanks for info. the meaning really realised me now , the deep meaning inside the small shloka ; after reciting the same shloka for past 1.5 decades . . thanks for the meaning . .
the meaning really made me understand what i was reciting tha same shloka past 1.5 decades. . what a deep meaning inside a small shloka ! thanks. .! may god bless u .....! Nice explaination. May God bless you to continue this great work! Extremely useful and thank you. Thanks a lot. Apart from your wonderful and erudite explanation , for which I am really thankful , your starting few lines comparing native people & NRIs regarding our culture are worth appreciating. We all are almost aware of this fact , very few point it out like you did , but the thing is do we really have any solution ,if not, can we suggest some option ,or shall we leave as it is on the will of god.?? Solution? So that people in India don't forget it? Well, in lines with a great politician of recent times who couldn't make a govt. 'India' is a 'state of mind' :) :) It is not the geography. Some people are tuned to these by their nature, and some realize it when they see it stand out, as when they travel abroad. 'ati parichayAt avaGYaa' = disobedience comes from too much closeness. A child may throw tantrum or ignore his/her mother, but may not do so with father. Those in India, take these for granted, those who travel abroad see it stand out and embrace it. Very nice to see the meaning of the Great Sanskrit shlokas. Was searching but found this blog as best. Thank you very much for this and please keep on going like this. I am happy to provide help in any form for this if needed. 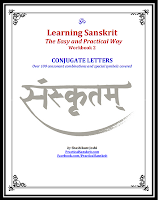 how to read and write sanskrit? how to study ancient works (of sanskrit)?